Since 1976, 22 House members, on average, have retired each cycle without seeking another office. Thus far this cycle, just five members fit that description: Republicans John J. Duncan Jr. of Tennessee, Lynn Jenkins of Kansas, Sam Johnson of Texas, and Ileana Ros-Lehtinen of Florida, and Democrat Niki Tsongas of Massachusetts. A full 17 members could announce their decision to walk away from Congress and elected office and the cycle could be described as an average occurrence. Of course, that’s not the narrative that’s likely to build. 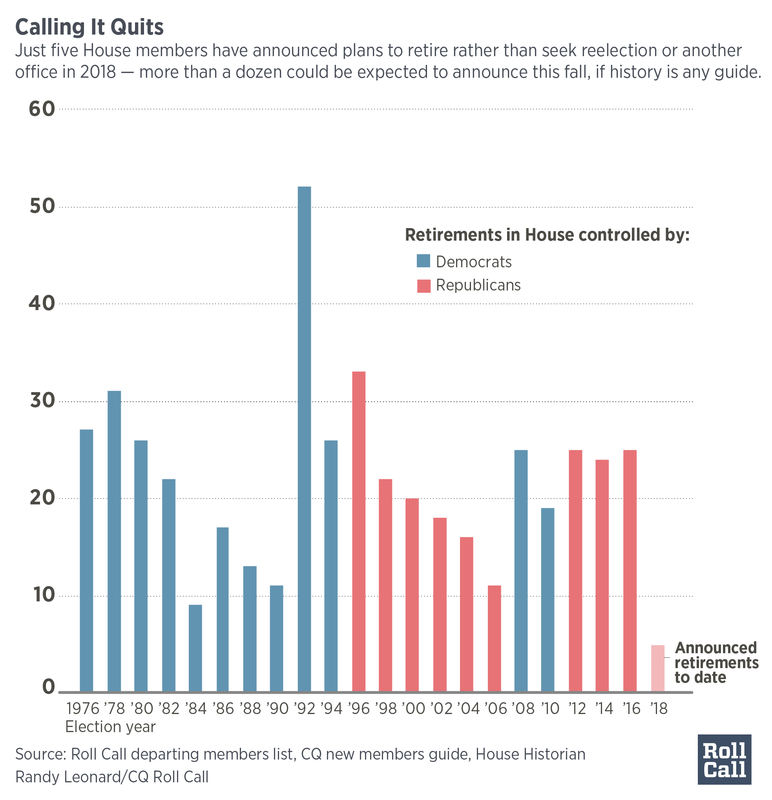 Open seats, including retirements, are critical in shaping the House battleground. Ros-Lehtinen’s departure took her 27th District from Solid Republican to Leans Democratic, considering Hillary Clinton won the south Florida seat by nearly 20 points, according to calculations by Daily Kos Elections. If Ros-Lehtinen had decided to run for re-election, it would not have been a top Democratic target. You can see the Inside Elections ratings for every race in Roll Call’s Election Guide and get updated analysis on over 100 districts in the new Sept. 1 House Overview issue from Inside Elections.